Almost immediately upon posting “A Fine Balance,” I started asking myself why I was so concerned about my Facebook privacy, particularly after viewing Everything is a Remix, Part 4: System Failure. In this video, Kirby notes that we are fiercely territorial about our own creations, but often “forget” this when we ourselves want to borrow. At the extreme is Disney, who shamelessly “borrowed” many of their stories to create their classic cartoons, and yet refuse to allow kids to draw their own version of Mickey Mouse to place on a cake (see opening scene of Shirky’s SOPA video). In “A Fine Balance,” my own thoughts center on both sides of the extreme, depending on what I myself own. This is slightly perturbing and I believe cause for deeper reflections. I have just attended the ECIS Annual Leadership Conference, a phenomenal conference about Forming the Future. As I reflect upon everything I have learned over the past few days, two things resonate. I first saw Dr. Ned Hallowell several years ago at a NESA Conference in Thailand, and I was thrilled to see him again recently. Among his several titles, he has written one of my favorite books for teachers and parents, The Childhood Roots of Adult Happiness. In this phenomenal book, he talks about five key principles that affect adult happiness, the first being to create a sense of connection. Dr. Hallowell states that, “Nothing promotes success more powerfully than the force of connection,” and that “at its most basic, connection is love.” Yet, this is a highly undervalued commodity, and in our society today, we are far more confortable with conflict than we are with the vulnerable state of love. Perhaps, it is that we lack trust. 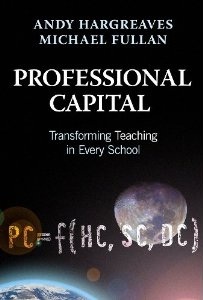 Dr. Andy Hargreaves recently wrote a book titled Professional Capital, in which he talks about social and human capital. If we zoom in on this example in the world at large, can we not say that an increase in trust would increase our human achievement? Steve Barkley, who has written Instructional Coaching with the End in Mind, defines collegial teams as those in which teachers work together and their decisions are highly influenced by each other. He states that, “until a school becomes collegial, it will not reach maximum student achievement.” What do we need to work collegially? My original question still looms. Why the concern about my Facebook privacy? Do I really care if strangers see a picture of my daughters? Yes and no. It depends on what they are doing with the picture. I will be highly flattered if someone shares a picture of my baby because she is adorable and highly disturbed if someone were to try to sell it and make money off of it or worse. I have to trust that the picture will be used for good before I can be comfortable releasing the picture. And therein lies the concern. We are a society consumed with conflict, so much so that we are trying to stop sharing on the web. I am all for sharing if we can operate from a place of love and trust. And therefore, I am revising my view of online privacy. At the risk of sounding preachy, and as my gurus above advocate, we must get to a better place, a place where we are working together for the common good. A place where love and trust are the norm. You bring up some valid points, but I think there are more things to consider when discerning online privacy, especially if you live in a place with high crime rates. Having lived in a country with serious safety concerns, I view that your personal information be kept out of Facebook or other online sources or at the very least your online privacy strictly controlled in such environments. Your online privacy should be as secure as your house. For example, in some countries any information that might give potential criminals information like who your kids are, where they go to school, where you work, where you live, or when you will be away is reckless. I know people who have been kidnapped for having such information revealed to the wrong people. Apart from this there are other social concerns that one needs to think about. For example, you host a birthday a party and then you (or worse yet someone else) post images or videos of the party online. But someone you forgot to invite sees the pictures. Who hasn’t had birthday parties where you forget to invite someone you should have? Or maybe the list is getting too long and you don’t invite someone that you wish you had. I wonder how many strained relationships have happened over Facebook postings or worse yet, how crimes? I agree with Adrian. The need for more privacy can really depend on where you are. For example, I used to live in Guatemala, and my husband is from there so we go back every summer. We currently live in super-safe and easy-living Abu Dhabi. I have to dramatically switch into safely and protection mode as soon as I step off the plane in Guatemala. Break-ins and armed robberies are daily occurrences. One of the latest worries is that some children are being kidnapped for their internal organs. When I worked there, the school told us to vary our routes when going to places so that it would be harder for people to track us. As Americans in Guatemala, we stood out. And for Guatemalans, if you’re American, that equates wealth. So how does this relate to digital privacy? For places like Guatemala, I wouldn’t be posting where I’m having coffee and with whom. That’s just inviting trouble. Adrian has another point about posting pics of birthday parties on facebook. After teaching grade 1 for 9 years, I will always be a grade 1 teacher at-heart, meaning it’s important to make sure you always include others and treat others the way you’d like to be treated. I have seen facebook photos of parties that I wasn’t invited to as an ADULT, and it hurt my feelings a bit. It doesn’t matter whether you’re 4 or 40, it’s human instinct to yearn for connection and inclusion. So think before you post–is this going to be hurtful to someone else? Great connections Tara! As a teacher, I try to develop a classroom that exemplifies these two characteristics. I try to find something to love about each of my students and as the year progresses I truly feel connected to them for various reasons. They are each unique and loveable in their own way. Also, one of my primary goals is to develop a classroom community of trust. In my opinion, this is the most important thing we can do for the students we teach – create a safe place for them to explore and inquire. This can be very hard to do effectively but when a good foundation has been established, children learn from each other and become risk-takers with respect to their own learning. I think that it is hard to trust complete strangers with our privacy especially when we live in a CNN society of fear-mongers but as you mentioned “it is the strength of the community that makes a difference” and only by trusting can we open the door to opportunity. Thank you for all of your comments. Yes, I agree that there are many flaws with being too trusting and I am a private person in real life, so Internet privacy means a great deal to me. However, it would be nice to aspire to a state of more trust. I just feel it is ironic that we (as a society) are concerned about our own privacy and intellectual property, but find ways to “borrow” all the time. Sharing personal information and photos should never really be necessary. Why on earth would Facebook even want our family photos? What on earth would they gain from them?